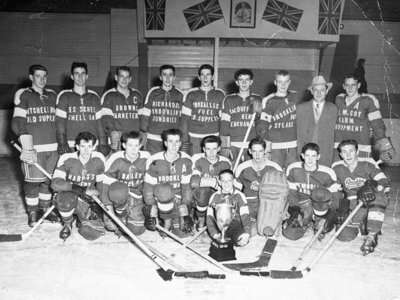 Black and white negative showing the Brooklin-Port Perry Combines hocketeam that won the Ontario Hockey Association Junior D championship. Back row: Murray Jones, Garnet Warner, Doug Vipond (captain), Jack Owen, Charles Grandy, Don Tran, Bob Carnegie, Cliff Johnston (manager), Bill Cornish. Front row: Elmo Gibson, Paul Tran, Neil Pascoe, Grant Jones, Clyde Johnston (mascot), Bob Johnston, Don Vipond, John MacDuff. This team defeated Elmira in the championship series held at the Port Perry Arena on 14 April 1956. This photograph appeared in the Daily Times-Gazette on 19 April. Brooklin-Port Perry Combines, 1956, David Edge. Whitby Archives 21-005-031.